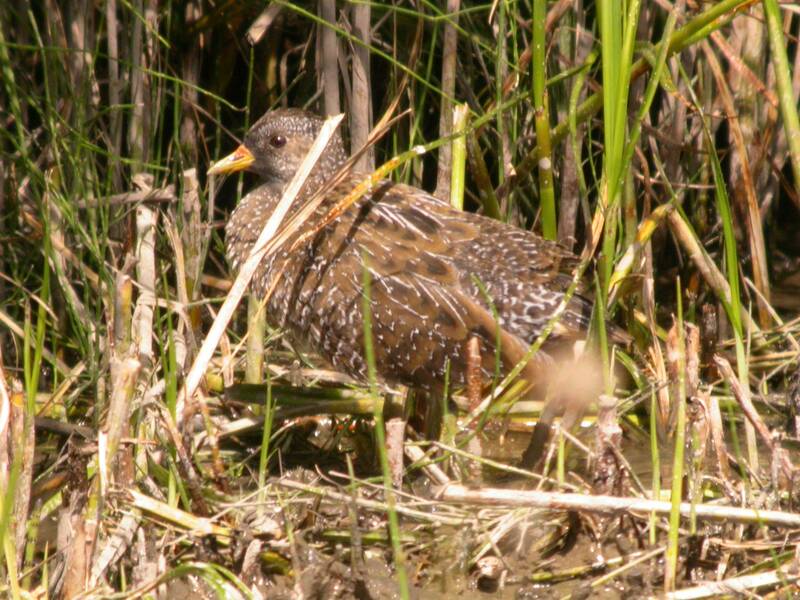 A strong contender for ‘bird of the month’ for September was the spotted crake present on 22/9, which put in regular appearances in front of the coffee shop throughout the afternoon (photo shows a bird seen previously). This was the fifth record for the reserve, the last being in August 2009. A short-eared owl seen earlier on the same day was another good bird for the reserve, while autumn wader passage featured a little stint on 24/9 and 25/9, and another wood sandpiper briefly on 5/9 following August’s long staying bird. Meanwhile the first jack snipe of the winter season made an appearance on 7/10 showing well in front of the Tal y Fan hide. Other waders of note have included regular greenshank with a peak of at least six birds on 7/10, small numbers of black-tailed godwit almost every day, bar-tailed godwit on 9/9, knot on 20/9 and 22/9, and golden plover (particularly scarce on the reserve) on 21/9. The last whimbrel was seen moving through on 13/9, and common sandpiper was present on several dates up until 29/9. The presence of greater numbers of wildfowl is another indication that winter is only just around the corner, with wigeon and teal numbers noticeably increasing throughout the month. A female pintail was also present on the deep lagoon from 5/9 to 11/9 while small numbers of pochard, shoveler and merganser have been frequent, and a party of up to 20 goosander has also been a regular sight on the estuary. Sightings of kingfisher and water rail have also increased in recent weeks with both birds showing regularly from the coffee shop. Chough are once again making regular flights over the reserve with the first sighting on 29/9, another sign of the winter season when we suspect they move between roosting sites on the Great Orme and feeding areas up the Conwy valley. The first redwing of the year was reported along the estuary track on 7/10, while we’ve said goodbye to the remainder of our summer visitors with the last recorded sightings of garden warbler (12/9), lesser whitethroat (8/9), sand martin (9/9) and swallow (22/9). Other passage migrants included a yellow wagtail on 7/9 and 8/9, a redstart on 21/9, and wheatear on 2/10. Two otters put in a good show from the Tal y Fan hide around mid day on 20/9 while fox sightings have been regular. Invertebrates have gradually become less visible as the autumn progresses, but there’s still been a number of sightings of common darter and migrant hawker dragonflies and speckled wood butterfly. Events during September included a Waders Walk on 9/9, led by the warden and focusing on the autumn wader passage which proved very popular, while volunteer led Wildlife Walks took place each Saturday morning throughout the month. The Feathered Friends Food Festival event on 29/9 gave advice to visitors on feeding garden birds over the winter, while younger participants were able to make their own bird cakes and feeders to take home. Younger visitors also took part in the Under Bug Rock Story Telling and Activities event on 30/9. Meanwhile new regular activities for adults included Tai Chi and Nordic Walking which both began on 6/9 and will continue to run on Thursdays each week. Other regular events included weekly Muddy Puddles sessions for pre school children each Wednesday morning, and the popular Farmers Market on 26/9 which is always held on the last Wednesday of the month.